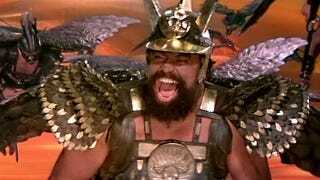 If you know the venerable, boisterous actor Brian Blessed, you probably know him as the leader of the Hawk-Men in the Flash Gordon movie, the voice of Boss Nass in The Phantom Menace, or his masterful performance as Augustus Caesar in I, Claudius. But you almost knew him from Doctor Who. In an interview for Radio Times, he explained that he was approached to star in the show in the mid-1960s, suggesting he was asked to step in as a replacement for William Hartnell who launched the show, and was eventually succeeded by Patrick Troughton in 1966. Blessed said: "After I was in Z Cars, the head of BBC serials took me aside and said, 'We're thinking of having a young Doctor Who and we'd like to cast you'. But it clashed with other things." Asked what his reaction would be now, he said: "I'd jump at it." It's an interesting bit of trivia, not least because Brian Blessed would have been the craziest goddamned Doctor of all time. He would have made Tom Baker look as serene as the Queen Mother. Seriously, do you know what Brian Blessed the actor does in his spare time? HE PUNCHES POLAR BEARS. You think the bad guys of the universe were scared of Matt Smith's Doctor? Blessed would have made the Daleks wet their little hoverskirts in pure terror whenever they even thought about him.